We’re back for another installment of the action packed ‘Die Hard‘ series, the fifth chapter in the series that has spanned twenty-five years. We’ve followed John McClane to the top of a skyscraper, 50,000 feet in the air on a jumbo jet, a cat and mouse chase around a metropolitan area, and even cyber terrorism. Prior to the screening, I even thought “Haven’t we already said all we need to say with this John McClane character?” Needless to say, ten minutes into the film, I found myself grinning ear to ear and holding on to both armrests ready for a highly entertaining thrill ride. 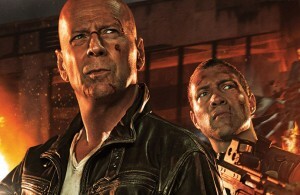 ‘A Good Day to Die Hard‘ might lack in story structure, but completely makes it all up with its intense action sequences and two solid performances by Bruce Willis and Jai Courtney.